Today is the site anniversary. Now, if you're anything like me, this comes as a complete shock. I assumed this would burn down after a few months. It'd last until September at most. Now, I wasn't really sure what to do for it at first but it came to me in a flash. I'd get one of them fancy shmancy web-domains, but then I remembered that http://www.chickenmaker.com/ was taken so it was too much hassle and was unsure again. So, then I put it off for a while then BAM! It hit my like a bus. It's St. Patrick's Day. So, I'm just gonna green up some of my personal favorites from the past year. On a side note... yes Anniversaries do count as holidays. Though I guess this goes in there regardless, huh? Shades McCoolGuy is cutting in with a special appearance. Just think of this as a holiday special. It's a pretty good one I'd say. It's set between the 2nd and 3rd parts because that's where random specials go if you have a trilogy. 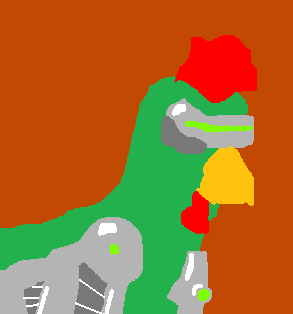 This cyborg chicken was one of my earlier ones. I think of it as one of the better ones, though the waddle is very poorly drawn and I'd have never stood for that sort of quality if I'd made it fresh today. The Gritty Sharpness is the best style ever, no doubt. 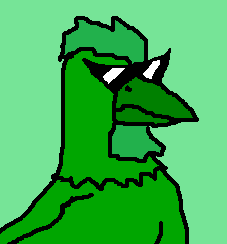 It even works in Green. Look how cool he is. Also for a short while I'll be trying out one of those "You may also like" things. I'll decide to keep it or not depending on how intrusive it seems after a while.